There are a number of choices of hotel style accommodation in Agra. With 176 to choose from, Hotel Sarwan is a great option. Within Agra, Hotel Sarwan ranks as 3rd most popular hotel style accommodation. Hotel Sarwan meets all the needs of travellers looking for economy lodging in Agra. Hotel Sarwan is a suitable choice for short visits to Agra with comfortable rooms and all the basic facilities you require for a quick trip. 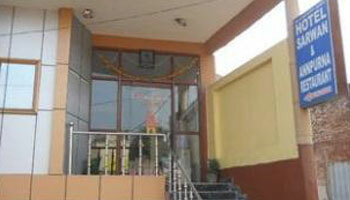 Hotel Sarwan offers attractive and budget friendly Agra accommodation. Airport Transportation, Laundry Facilities, Security Guard, Breakfast Services, Doctor on Call, Backup Generator, Room Service, Currency Exchange, Parking, Travel Counter. Attached Bathroom, H/C Water, Iron/Ironing Board, DVD Player, Air Conditioning Room, Cable/Satellite TV, Toothbrush/Razor on Request, House Keeping, Wakeup Calls.